One of the many questions I am asked is How DO You Cook Fresh Pasta? The secret to great Italian food is in the ingredients. The most important thing is the ingredients of each recipe need to be fresh. The cook great The Bald Chef has a great list of Italian recipes to share with you. Here is some of my stand out Italian recipes. 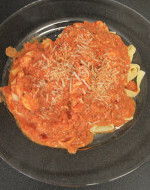 Italian recipes include veal dishes, seafood, and pasta. Lasagna, Pizza, and Spaghetti with meatballs are all some of the most popular Italian recipes. Fettuccine Alfredo is a classic Italian recipe! The Bald Chef has recipe that range from Northern style to southern style Italian cuisines. Another popular Italian cooking recipe is risotto. When it comes to meat, I like Spicy Italian Sausage, Meatballs, Chicken, Fish, Squid, Veal, and any type of Seafood. Italian recipes differ between the differnt regions of Italy. The best of Italian cuisine lies in its diversity, though Italy is a small county the cooking styles are very differnt from village to viilage.In the North of Italy the recipes tend to be made with rice or polenta.When looking at Southern Italian cooking you think more of pasta and seafood recipes. Seafood recipes from Italy are some of the best in the world. Italian’s enjoy many different types of seafood in their recipes. This of course includes shrimp, fish, clams, oysters, lobster, mussels,octopus and squid. Italians consider fresh seafood quintessential in the recipes. Just go do an Italian seafood market and you will see how important it is yet truly fresh fish, shellfish, and many other types of seafood.